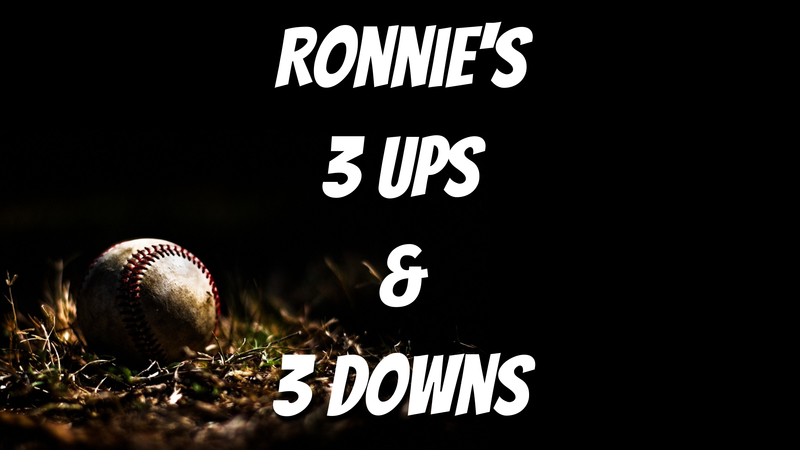 Welcome to Ronnie’s 3 Ups and 3 Downs! This column looks at some fascinating matchups and facts that might pique the interest of the reader as that day’s games are reviewed. This is my attempt at creating compelling thought on any given day. Meadows is on fire over his last 6 games batting .545/.630/.1.182 with a 18.5% walk rate. He’s accumulate 1.0 fWAR in those 6 games with a 374 wRC+. He’s making pretty good HC in that time at 42.1% but the really impressive feat is his 57.1% HR/FB. His opponent today, Dylan Bundy, is allowing a massive 4.38 HR/9 on the year with a disturbing 51.5% FB. Opponents are only making 33.3% HC against him in 12.1 innings on the year, but a 35.3% HR/FB given his FB spells trouble for Bundy. Meadows should be a home run matchup here…pun intended. This pick is mostly matchup based. Tatis has been the best fastball hitter on the Padres with 2.3 wFA on the year. He’s also one of only two Padres performing positively against the slider (Wil Myers being the other) at 0.5 wSL. Tatis’ opponent today is the Rockies Jon Gray. The Colorado righty relies heavily on two pitches, his fourseam (49.4%) and his slider (33.1%). Tatis Jr, who’s hitting .333/.350/.722 in the last 7 days, should be all set up for a good day. This should be a slam dunk for DFS players. Margevicius is pitching very well to kick off his rookie year. In 16 innings he’s stuck out 12 batters while walking just one en route to a 3.75 SIERA. He has a fantastic 50.0% GB and opponents have just a .220 wOBA against him. He couldn’t have a better matchup today as he faces an anemic Rockies offense. OVer the last week, Colorado has a -27.0 wRAA and a .096 ISO. In that time they are walking at just a 5.8% clip while striking out 28.4% of the time. Rosario is on a hot streak right now with 3 home runs in his last 7 games. This is the day that his hot streak ends. He is hitting ground balls at a 43.5% rate in that time and he is particularly vulnerable to the sinker, a ground ball inducing pitch. On the season he has a -1.5 wSI. That’s trouble today as he faces Toronto’s Aaron Sanchez. The Blue Jay hurler throws a sinker 44.1% of his pitches and has a 45.4% GB on the year. Currently leading the league in batting at .429, Anderson is off to a monster start. He’s slugging .653 on the season but has only 1 extra base hit in his last 5 games. In that time he is making just 14.3% HC. He has performed well on the year against just about every pitch out there except the curveball against which he owns a -12 wCU. His opponent today is the Jorge Lopez of the Kansas City Royals. Lopes throws his curve 31.3% of the time on the year but you can be sure that Anderson will see a steady diet of hooks today. The Phillies Jean Segura has not hit well over the last week. He’s making only 18.2% HC over 29 PA. He also has a 50.0% GB, though his batting average is a nic .317 he has a .333 BABIP suggesting that luck has played a big part in that. Steven Matz is Segura’s bain today. Matz is inducing hitters into a 47.5% GB and is currently striking out batters at a career high 10.47/9. Matz is a heavy sinker ball pitcher throwing it 62.1% of the time. Segura has a -0.2 wSI in his hast 29 PA.